Rian – Wife of Huor, mother of Tuor. Morwen – Wife of Hurin, mother of Turin, Nienor, and the short lived Lalaith. Beleg Strongbow, called Cúthalion – elf of Doriath, really really loves Túrin. Thingol and Melian – elf and maia rulers of Doriath. Gwindor – the elf from Nargothrond who had tried to avenge his brother in the last one and got taken by Morgoth. Now he’s super duper wrecked after being forced into hard labor. Three guesses who she falls in love with “against her will”? 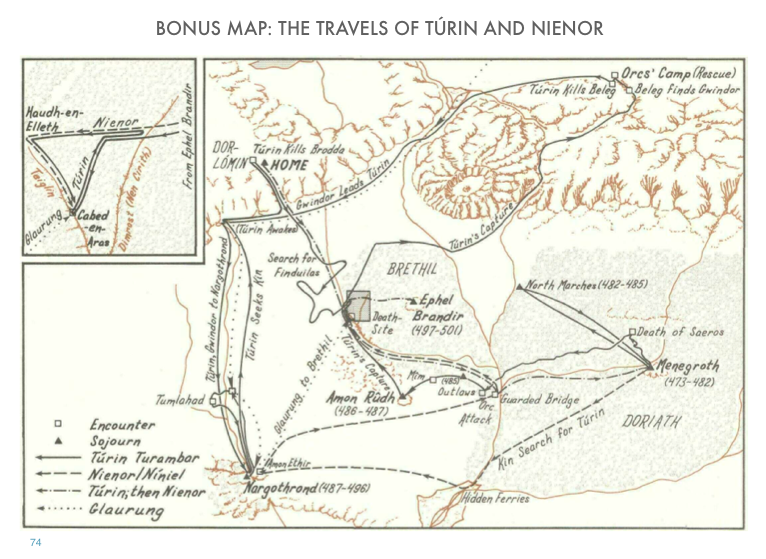 Here is a map show casing the travels of Túrin and Nienor.